What's the difference between "living to eat" and "eating to live?" I asked myself that question years ago when I was expecting my first child, Rachael. I was raised on a farm here in the Finger Lakes and spent just about every summer and fall season tending to the family garden. I took for granted the quality of the fresh food I was raised on but appreciated all that I was taught about eating natural and fresh when I began having my own children. I wanted only the best for them. and provides an expansive environment to explore and learn. 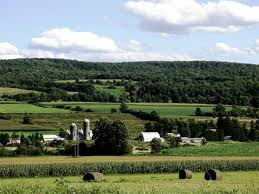 My dad plowed a very large section of land and we would all join in to plant the seeds and seedlings for that year's crop. The crops were cared for in ways my father knew about from his childhood in Poland. Little did I know he was an organic farmer who strived to provide us all with the most healthy, fresh foods he knew how to grow. He taught us to use our own valuable resources to feed and protect our plants naturally with recyclable products found right on our own premises instead of using chemical fertilizers and pesticides. Our chickens and cows did their part in providing necessary fertilizers! Dried, composted manure was used to add valuable nutrients back into the tilled soil. He knew about the multi-purposes of lime. 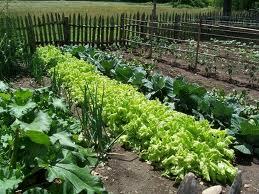 It is good for keeping bugs and grubs off of growing vegetable plants, but also for conditioning the soil, bringing the soil acidity of the manure to a neutral state for better pH nutrient balance. Organic vegetables grown locally are freshest and are richer in vitamins and nutrients than those bought in the grocery store that have been shipped far distances before getting to your table. I strive to prepare my breakfasts with fresh and local organically grown fruits and vegetables at 1922 Starkey House. I also use fresh, local eggs from pasture fed chickens for my omelets and other breakfast goodies. I find that they have richer yolks, orange in color and the taste is outstanding. I routinely hear comments from my guests about the delicious flavor of any of my egg preparations. Once again, eat hearty and eat healthy. Freshly-grown, organic food is your medicine.